Narrative: Made at Cambridge reserve and sold in local community by Mi'kmaqs; Prices ranged from 10 cents to 25 cents; Sold at Xmas or Easter, filled by parents and given to the donor; Could be used later for berry picking. 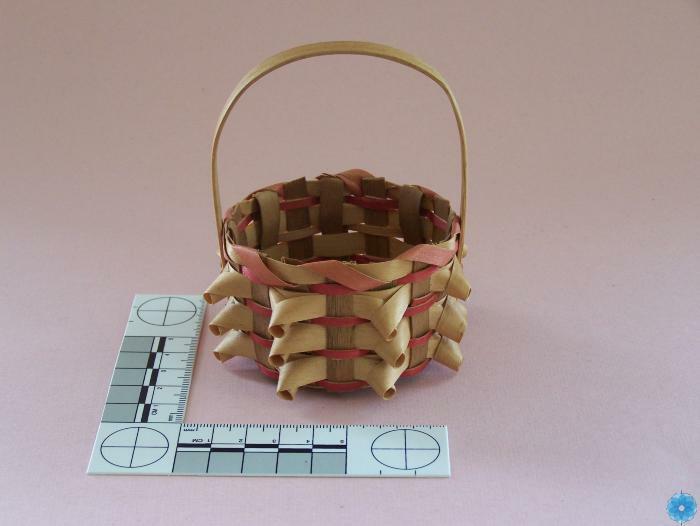 Description: Round-bottomed basket, checker-woven of natural woodsplint alternating with rows of narrow pink dyed splint. Raised decorative "porcupine" "jikiji'j" weave. Splint-bound rim. Overhand handle.